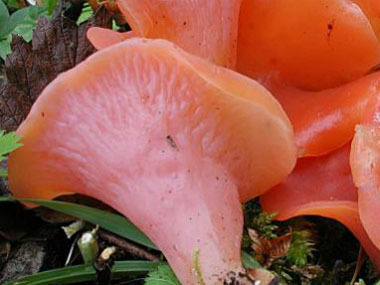 Overview: The apricot jelly fungi is a widespread fungus easily recognized by its unique shape, rubbery texture, and orange to salmon-pink colouration. The taxonomy has a bit of a convoluted history, resulting in many older field guides listing this species as Phlogiotis helvelloides or Tremiscus helvelloides. 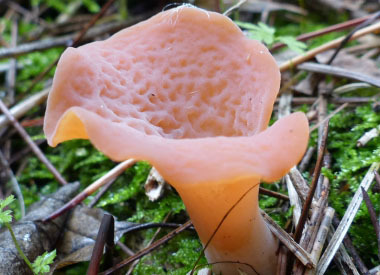 It is a saprobic jelly fungus that is quite unique as it dries out, yet rehydrates repeatedly as the rains come and go. Interestingly, they produce a new set of spores each time they rehydrate. 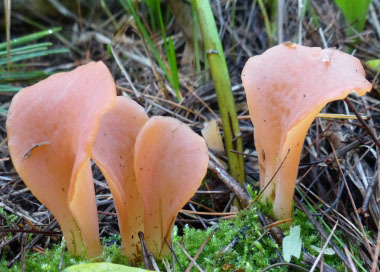 Distinguishing Features: This edible fungus has a petal-like firm, yet gelatinous (sometimes rubbery) fruiting bodies that are quite easy to identify because of the shape and colour. Some people refer to their shape as being similar to a horn or a trumpet. The stem base has regions of white mycelium. 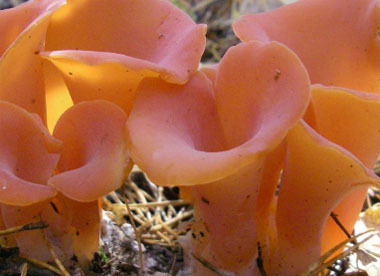 Height: Apricot jelly grows anywhere from 2 to 10cm tall (up to 4”). It can grow to 6cm (2.5”) wide. 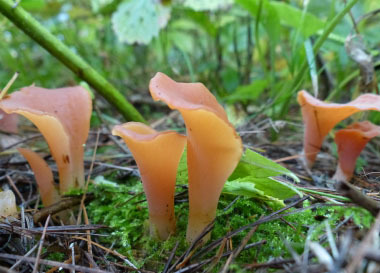 Habitat: These fungi can be found on the edges of well-decomposed conifer forests, and rarely can be found among hardwoods. They appear either solitary or in a group. Apricot jelly typically grows on the ground or on well-rotted wood, and almost always under conifers. These can be found in several locations around the world. Season: Apricot jelly appears in the summer months and into the autumn (also in the winter in warmer climates). Edibility: Some people claim this has a mild sweet taste, yet most people say it is without flavour. 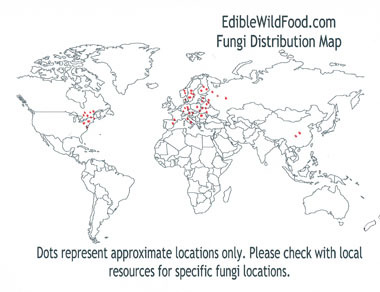 Although some people have eaten these raw, it is important to cook all fungi before eating. 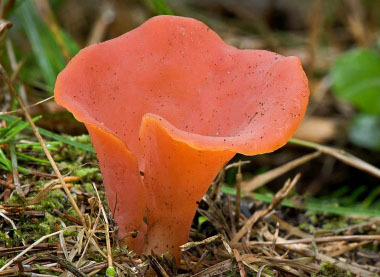 Other name: Candied Red Jelly Fungus.